It’s January; twinkly fairy lights, yuletide festivities and tidings of good joy have been cast aside and in its stead it’s been replaced with talk of freezing cold weather, dark mornings, grim diets and overstretched bank balances. So, when looking for some blog inspiration this morning I knew something cheerful with just the right amount of fun was needed and I found just the thing filed away for such an occasion. Hiram College is a private liberal arts college located in Hiram, Ohio and back in November they announced the Terrier Scholarship; a one-time $1,000 scholarship that will be awarded to five incoming Hiram students who impress the judges with their love for all terriers great and small! Hiram College has long since had the terrier nickname and mascot in place and last year decided to give incoming students an opportunity to showcase their creativity and pledge their love and devotion to those ever popular pups. 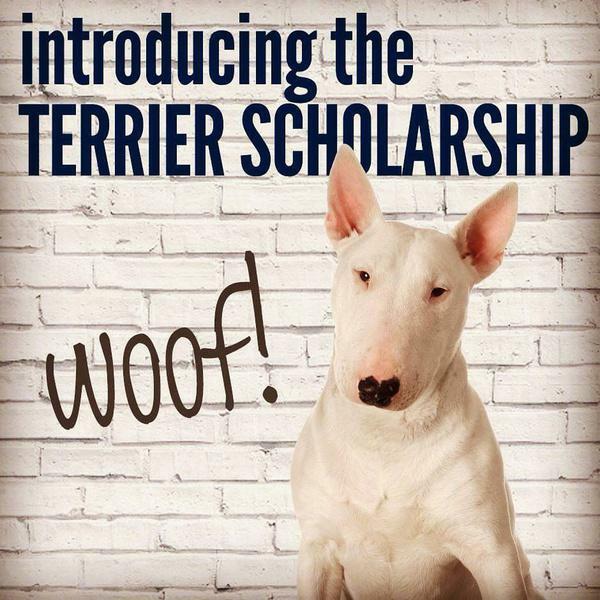 Incoming students who wished to enter were asked to submit a photo or a 15 second video of themselves with their terrier or a terrier close to their hearts. Submissions had to show what makes terriers special, how they are part of the family, a best friend, how they’re fast learners and more. All breeds of terriers were accepted and a panel of Hiram media and photography specialists were selected to choose five scholarship recipients based on the creativity and originality of photo submissions. We absolutely loved this campaign when we spied it back in November and can’t wait to see the winners announced in February. A scholarship contest like this one is a really fun way of helping students get on board with the school spirit before they even set foot on campus.